A swiss roll is the same thing as a jelly roll: a thin sponge cake that is rolled up into a spiral and filled with a sweet filling of some kind. The cake itself is simple and plain. Unlike butter cakes, which tend to crack or crumble when they are handled a lot, this type of sponge cake is very pliable. It is easy to roll and re-roll the cake, spreading fillings onto it without tearing into the body of the cake. I use pretty much the same recipe every time I make a jelly roll because it turns out cakes that are soft, easy to work with and very consistent. Jam is one of the most common jelly-roll fillings because it adds flavor, sweetness and some extra moisture to the cake. 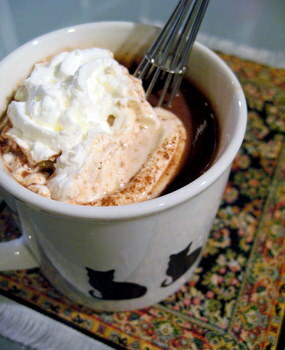 Whipped cream is probably the second most common filling. Anything from softened ice cream to chocolate mousse can be used, as well. For this cake, I turned it into a play on chocolate covered strawberries. I used both a cream cheese filling and a layer of strawberry jam in the center of the cake, and finished it off with a generous layer of chocolate ganache.Â The effect – because of the large cake component here – is somewhere between strawberry shortcake and chocolate covered strawberries, with just a hint of cheesecake. The cake is fairly easy to assemble. The swiss roll sponge itself is very easy to handle when it is hot from the oven. Once it has cooled completely, it can be unrolled and a room temperature cream cheese filling can be spread inside. I spread my layer of strawberry jam on top of the cream cheese, although you could also mix the two or swirl them together. The chocolate ganache is simply poured over the cake. The edges of the sponge cake might be slightly firm after baking. You can trim these before filling the cake, or, as I like to do, after the cake has been filled to give it a neat and even spiral. I think that this cake is best served the day it was made, once the ganache has set (you can see a bit of chocolate smearing in the photo from the cake not being quite set). If you do need to make it in advance, make and fill the cake, wrap it tightly in plastic wrap and refrigerate it overnight – I wouldn’t wait longer, or the cake might dry out some – and bring it t room temperature and top it with ganache before serving. In a large bowl, beat the egg yolks with an electric mixer until light, about 2-3 mintues. Gradually add in the sugar, followed by the vanilla and vegetable oil, and mix until fully combined. Sift the cake flour, baking powder and salt into the yolk mixture and beat in on low speed until just combined. Quickly clean and dry beaters well, then beat the egg whites to soft peaks in a medium sized bowl. Beat cream cheese, butter, sugar and vanilla together until light and spreadable, adding additional confectioners’ sugar if necessary. When cake is cool, gently unwrap it and spread the inside with the cream cheese filling. Gently spread a thin layer of strawberry jam on top of the cream cheese layer. Re-roll and place on a serving platter. Some filling may ooze out during rolling, if so, just scrape off the excess to keep the plate clean. Melt chocolate chips and butter together in a medium bowl, working in short intervals in the microwave and stirring frequenly. When glaze is smooth, pour a small amount onto the cake and gently spread it into an even layer. Pour the rest of the chocolate on and smooth it into a thick, even layer (the first coat helps to keep things evenly spread). Let cake set out for at least 2 hours to allow the glaze to set up. 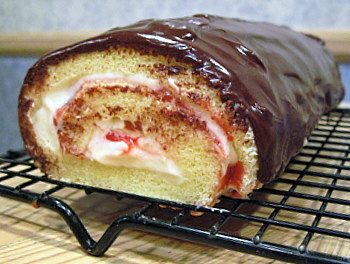 I simply loved this chocolate covered strawberry swiss roll…simply delicious and picture is great ! Looks great, sounds easy – my total nemesis. I’m going to have to try your recipe. I almost feel like the little engine that could. Ohh, I am drooling. I must try this recipe!!! This looks absolutely fantastic! I plan on making it this weekend. I was wondering, though, if I want to make a chocolate sponge cake, would it be best to use cocoa powder or melted cocoa bars?